Jacqueline Wakhweya is a Private Sector Development Advisor with more than 10 years' experience in the project management of international development programs associated with the U.S. Departments of State, Trade and Agriculture Missions abroad. Jacqueline is past co-Chair, Private Sector Donor Group of international bi-lateral and multi-lateral agencies supporting Government of Uganda’s Competitive and Investment Climate Strategy. 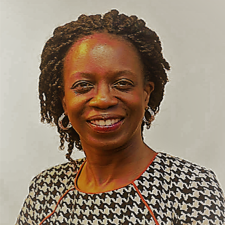 She led the Advisory Board of the Uganda Foreign Service National Savings and Credit Cooperative, coordinated programs in excess of$100 million with Government Agencies of the United Kingdom, Sweden, European Union, Germany, World Bank, Government of Uganda, U.S. Contractors, Philanthropic Foundations, Corporations, Civil Society and structured U.S. Development Credit Authority loan guarantee facilities with multiple commercial banks valued at $80 million. She has a Master of Business Administration from Edinburgh Business School, Scotland and a Bachelor of Arts in Social Sciences from Makerere University Kampala, Uganda.